Robin's probably the most interesting newcomer we have yet. 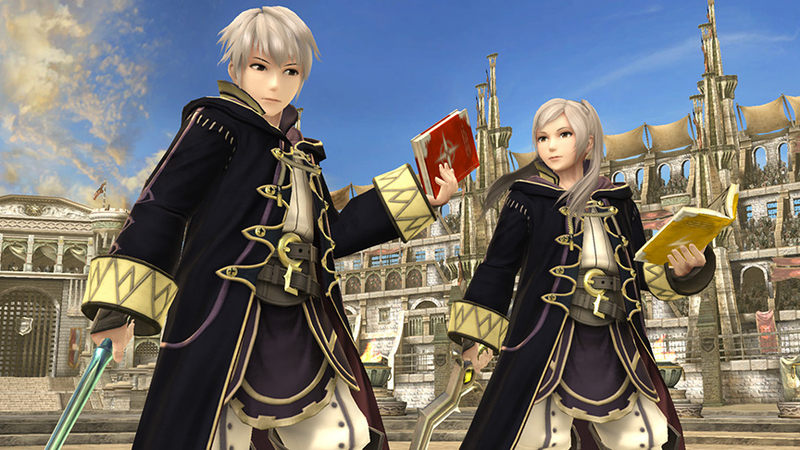 This character, who has both male and female forms, is kind of defined by duality: his smash attacks use a sword, which breaks, while his specials use a tome from which Robin uses magic. The tome also becomes depleted after a certain number of uses. Both of these regenerate over time. For some background on Smash Bros' version of the character, it's worth reading this translated interview with Sakurai. It includes a satisfying explanation of Sakurai's decision to include Robin but not Chrom. Anyway, I think this will be a really interesting and dynamic character and I'm excited to play with him (her)! Robin looks really interesting. very different from the other FE characters, but thats very awesome. Yeah, really different. Kind of makes up for the slightly baffling inclusion of Lucina. Robin looks really interesting. I read that interview before and it's really cool, wish he did more of those for more characters just to see what he thinks. And I am glad they went with Robin instead of Chrom. The reason Lucina is so similar to Marth is because she was originally intended to be a Marth Alternate Costume. That's mentioned as well. I guess they could change her up a bit more though. At least her stance and stuff so she doesn't have the same one as Marth. hmm thats true, hopefully with the final version of the game they change her up a bit a little more. but none of the less. Robin looks awesome!